Are you looking for a permanent solution to replace a missing tooth? Or perhaps you need to replace several teeth or find traditional dentures uncomfortable. Dental implants are considered the best, most natural and long-lasting replacement option for missing teeth. A dental implant is essentially a small titanium post that acts as a replacement for the root of the missing tooth. The titanium implant is placed directly into your jaw in a minor surgical procedure. After a short time, the bone and the implant fuse and the implant in effect becoming the root of a new tooth. The new visible tooth portion that is placed on top of the implant is called the implant restoration. All teeth – instead of dentures. In the case of a single missing tooth the implant restoration will be a single crown. In the case of multiple missing teeth your dentist can place a bridge or a denture over multiple implants. 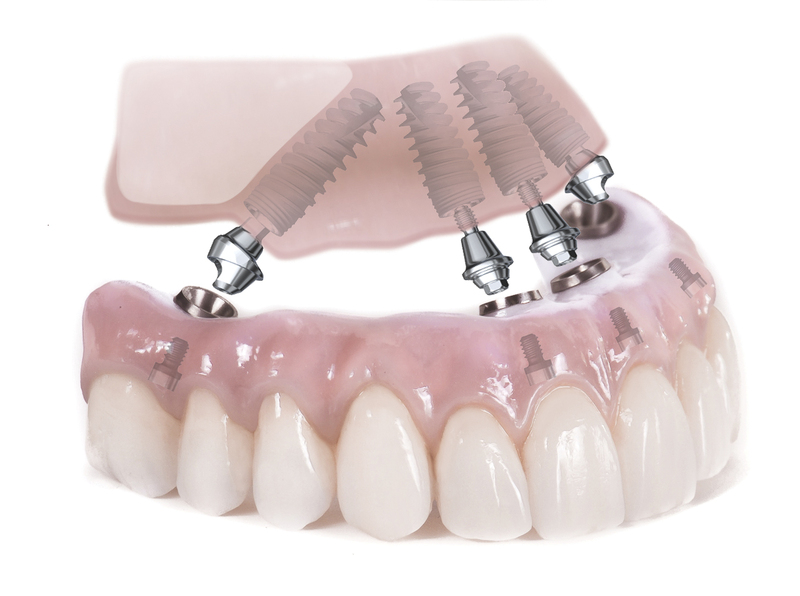 Today we are able to replace a full set of top or bottom teeth with as few as 4-6 implants. Dental implants offer a number of benefits over older tooth bridge technology and dentures making them an increasingly popular choice. Implants function like stand-alone teeth, which means they don’t attach to or affect adjacent teeth. Replacing missing teeth with dental implants prevents the inevitable bone loss associated with tooth loss. The bones in the jaw support facial structures like cheeks, lips and chin. Aside from affecting the appearance of your face, bone loss can also lead to problems with the gums, the bite, and other health and nutritional issues. In addition to preserving your jaw bone, implants don’t decay, and if kept clean, minimise your chances of causing gum disease. Smile, Talk and Eat with Confidence! One of the most common complaints with dentures is that they move when you eat. Dental implant feels and functions like your natural teeth, which means you can enjoy eating all your favourite foods, just like you used to. Last, but certainly not least, dental implants look natural, allowing you to talk, smile and eat with confidence! Whether you have lost a tooth or several teeth due to an accident, decay or disease, there are a number of reasons why you might be considering dental implants. The shock of losing a tooth or several teeth through an accident can be traumatic and demoralising. It is likely you will want a replacement as soon as possible. While implants are the best and most durable replacement option for most people, they are generally not recommended if you are under 18 years of age as the jaw and facial bones will have not yet finished developing. For most adults, however, dental implants are the best tooth replacement option. Even if it has been some years since your tooth loss, dental implants may still be a possibility. Your dentist will be able to advise whether the condition of your jaw and overall oral health are suited to dental implants. If you happen to be experiencing discomfort from poorly fitting dentures and long to return to the feeling of your natural teeth, dental implants may be the solution. The fit of full dentures can be improved with as few as two implants. 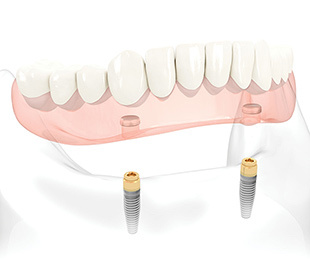 Implant supported full bridges or dentures are more comfortable and stable than conventional dentures. Because implants will replace some of your tooth roots, the jaw bone is also better preserved. If you have any questions or would like more information about whether dental implants are right for you, speak to the friendly team at Dental Square.